When it comes to blogging for business, a lot of companies wonder where to start and how they can make their brands newsworthy and interesting. You might not believe that every consumer will be eager to follow every word a company says, but you’d be surprised at how effectively some brands use their company blogs to engage with people. Let’s take a look at how some major brands are utilizing company blogs, how they are doing, and ways they could improve. What we find out along the way will help you develop the best approach for your own company blog. Then, once you have a sense of what you’d like to do with your company blog, we have some tips on how to make your blog appear in search engines so people can find and enjoy your content. Coca-Cola has an off-site blog called Coca-Cola Conversations which focuses primarily on Coke collectibles. 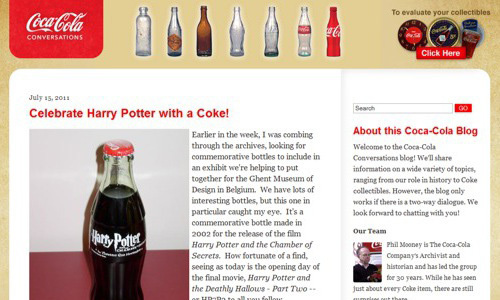 This blog does a good job at relating the company’s products to current events, such as a recent post about celebrating Harry Potter with a Coke. The clear description at the top, the faces of their team in the right sidebar, and the social media icons are all things to admire in this blog. While the blog boasts of receiving its one millionth visitor at the beginning of July, its engagement rate is much lower — to the tune of only two comments on the last ten posts. While posts are short and sweet, they don’t end with a compelling reason to comment such as asking for thoughts about the topic of the post. That could partially explain the blog’s lack of engagement. While it can sometimes come across to readers as excessive to use an explicit call to action at the end of every blog post, it’s important to challenge the readers in some way in at least a few posts. 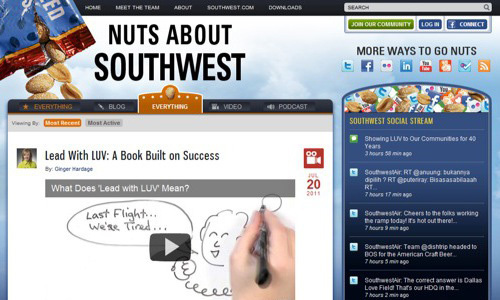 Southwest hopes people will be as excited about its off-site blog Nuts about Southwest as its own team members are. The blog focuses on the latest news for Southwest and the travel industry in general. This blog does a great job with social optimization in the sense that the designers have placed have all of the main social icons right at the top of the sidebar, as well as social sharing buttons for each post right on the homepage. The blog has a social stream in the sidebar that shows the latest updates from Southwest’s Twitter account, along with new posts and comments. Southwest has better engagement than most corporate blogs, with hundreds of social shares for some posts and anywhere from the goose egg to 25 comments. Like Coca-Cola, Southwest is also missing that closing line that invites people to want to respond to their post. However, excellent writing that more subtly encourages discussion can make up for that omission. 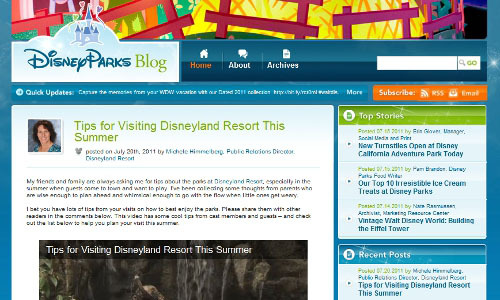 Disney brings its magical touch to blogging on its Disney Parks Blog. While the Disney brand is at heart focused on the kids, this blog’s content is perfect for parents looking to get some traveling tips. Unlike most blogs, Disney’s doesn’t emphasize its social networking profiles; instead, it only has RSS and Email subscription links. Disney does not include social sharing buttons for Twitter and Facebook at the bottom of every post, either. Engagement on this blog seems to be slow but steady, with a few comments per post and anywhere up to 100 likes per post. Again, the common lacking element is the call to action leading readers to want to comment. But then again, maybe this blog’s audience is not the commentarial type. Starbucks has a rather plain blog; it’s simply titled Starbucks. It focuses on the culture of coffee drinkers, from the food to elements that make up the coffeehouse environment. 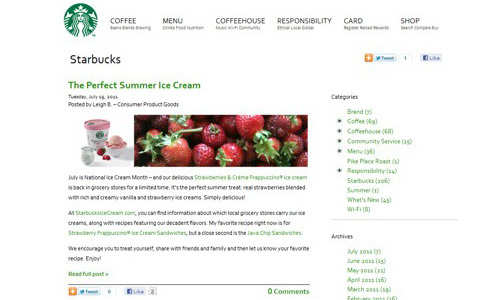 Starbucks uses its blog to bring in voices from all around the Starbucks corporation. It’s a great use of the medium. Just browse through the bylines to see titles of the bloggers: Consumer Product Goods, Marketing Project Manager, Executive Vice President of Public Affairs, and Senior Green Coffee Specialist. Comments and shares per post are pretty good, with many posts getting 15 – 25 comments and one with over 9,000 likes on Facebook. Starbucks’ team definitely has a strong grasp on what its community is interested in and what will get that community talking! Quicken Loans’ Zing is last (but not least) in our who’s who of corporate blogging. This blog’s focus is anything to do with finance, from personal to business financial topics. Zing does a great job showcasing its authors as experts, as well as sharing their social profiles right at the top of the sidebar. The design is clean yet very modern. Unlike most corporate blogs, the articles are quite in-depth. Most are composed of around 700 words, meaning that when Quicken offers seven tips on college tuition savings, you’re really going to get some detailed advice and not just aggregation of information you see elsewhere. Quicken isn’t afraid of sharing links to other sites as resources. Some corporate blogs have a phobia of that practice, but the merits or downsides to that depend on the circumstances and each company’s search engine optimization strategy. It works quite well for Zing. If you still need more blogging inspiration, visit Alltop’s listing of the corporate blogs including their latest five posts. And feel free to share your favorite corporate blogs in the comments too. Let’s keep building this list!